Mathematical "magic" maths workshop involving mental maths, problem solving, computation, memory and concentration skills whilst having fun at the same time! 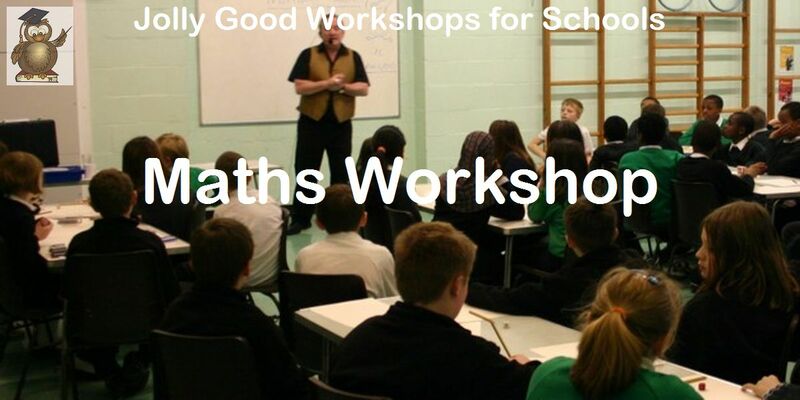 Ideal for a maths week, rewards day or just for something different to inspire the children. 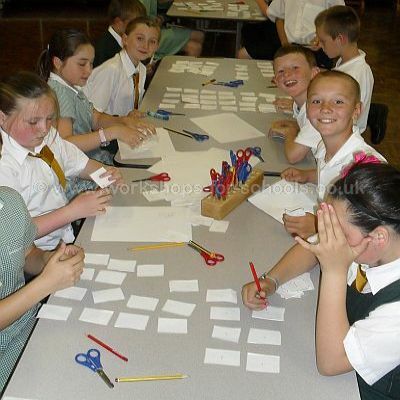 A great way to get them applying their maths skills in an exciting and fun way. 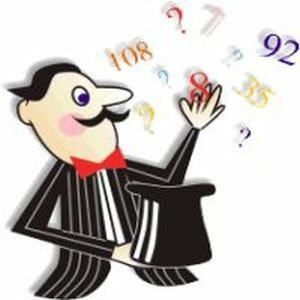 Everyone wants to know how a magic trick works and these tricks have been specially selected because they use mathematical principles to create puzzling and sometimes stunning effects. stimulating further interest in mathematics. helping to build self confidence, speaking and presentational skills. 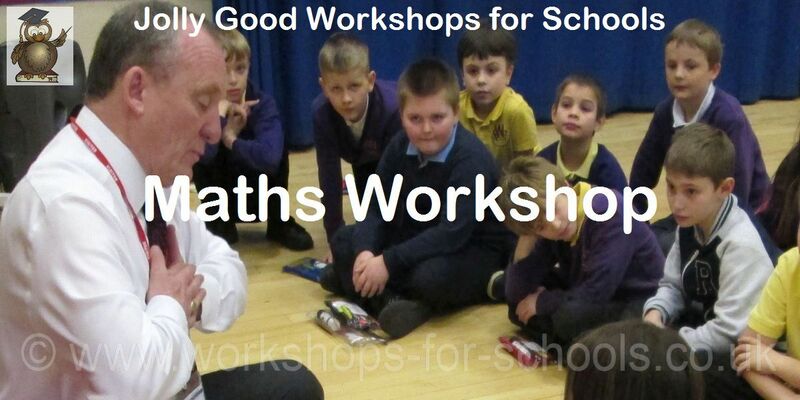 Even children who don't like maths will be engaged and joining in! These children are making a set of number cards to use in a magic square. 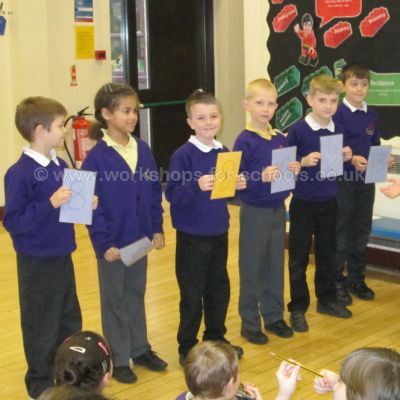 The children get to keep the cards they make at the end of the workshop. 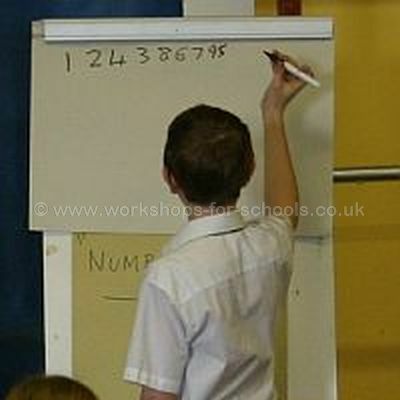 A volunteer writing out a string of numbers which he is making up as he goes along. These will be used in a sum to produce an answer which then cracks a secret code. Exciting stuff! Taking notes can be useful as some of the insructions need to be thought about carefully. Writing the instructions down helps to get the process firmly in place. 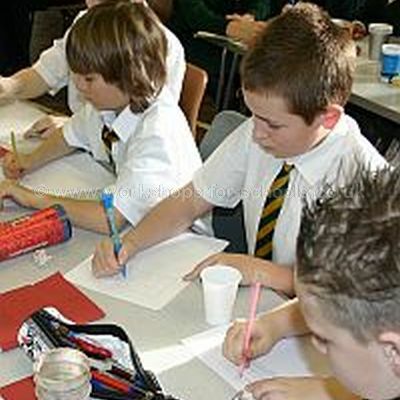 Although these boys are doing calculations on paper there is also quite a bit of mental maths involved too. Dice and playing cards are also used. Practice makes perfect. Once you know the method its best to have a go yourself and test the theory. Once you have proved it works there is no holding you back. This one is a bit like pairs with the cards all face down. The numbers on them are concealed and yet when apparently randomly selected cards are picked up and their values added together the answer has already been secretly written down. Wow! Rapid maths! How did he do that? He added up six random numbers in his head before we had even picked up our calculators. These children are about to find out how to amaze their friends with their mathematical genius. There are some very well known number tricks which are fairly easy to do once you know how. Listening carefully to the explanation and remembering the steps are key to getting it right. 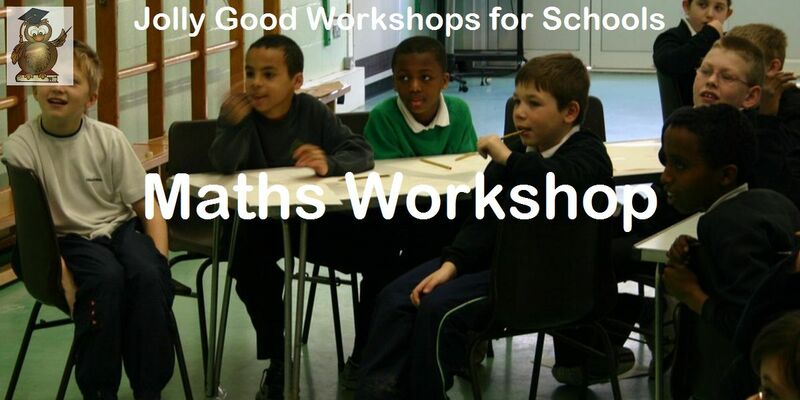 Can the Maths Workshop take place in a classroom? Yes, or the school hall for larger groups. Can the whole school be involved? Whilst primarily for KS2 we can involve the infants by putting on a short magical performance with some number content. What does the school need to supply? White board, tables, chairs and writing materials. 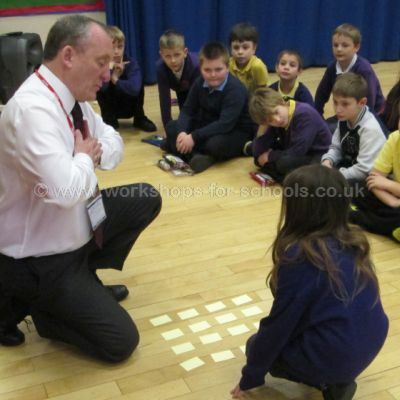 An effect is demonstrated, the children are challenged to say how they think it works, the effect is explained and demonstrated. The children then have a go themselves. What size groups can you work with? One class at a time is preferred but classes can double up. It also possible if absolutely necessary to work with three classes at the same time. 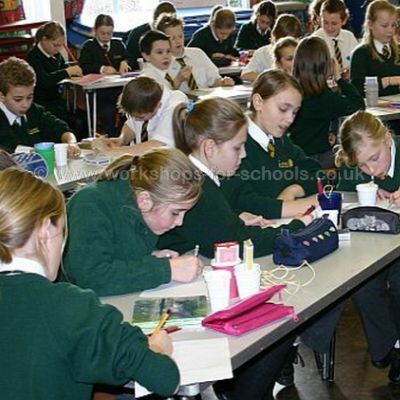 Each session lasts approximately sixty minutes but timings can be changed to fit more groups in or extended. 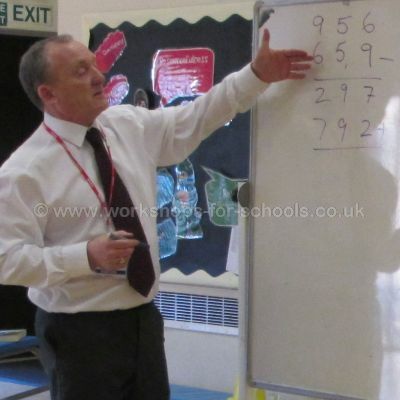 Ron lead a fantastic session with my year 4 class, this morning They were facinated by the number tricks that he let them try and it really got them engaged and enthused about maths. He had a lovely manner which encouraged the children to have a go. 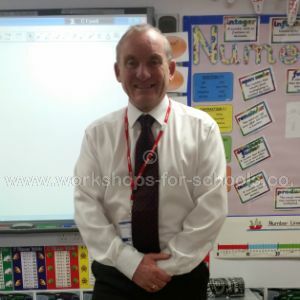 A brilliant and interactive workshop which I would definately recommend.